For a relaxing day out or a long secluded walk on the beach, Townsville’s five northern beaches are the ideal getaway. Bushland, Saunders, Toolakea, Toomulla and Balgal Beach combine the rugged bush with necessary amenities and beachside hideaways. For a pleasant change of climate and scenery, travel a little further north to the lush rainforest of Mount Spec National Park and find the picturesque village of Paluma. 1,000 metres above sea level and shrouded in misty cloud, Paluma has a rich and fascinating history. Much of the road leading to the village was built by hand during the 1930s Depression, as was the quaint stone bridge over Little Crystal Creek. 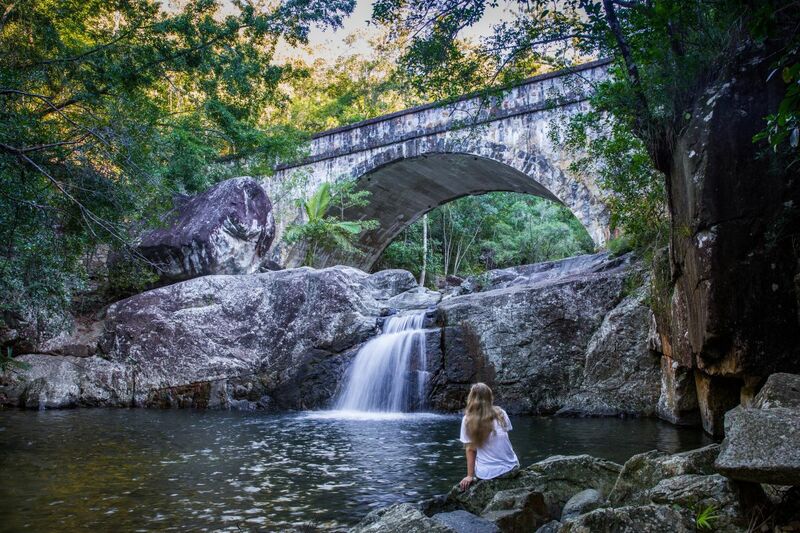 Today, Paluma is a popular mountain retreat for romantic weekends and a secluded place to unwind. The streets are lined with cosy cafes, art galleries and nooks for local craft and produce. And with little or no mobile coverage, you can truly escape and get back to nature while leaving those work-day worries behind. Situated on the southernmost edge of the Wet Tropics World Heritage Area, the lush rainforest surrounding Paluma is alive with a fascinating diversity of birdlife. See how many you can spy from the network of rainforest walks. Paluma is approximately 45 minutes’ drive north of Townsville. Accommodation in the village includes bed-and-breakfasts, cottages, self-contained units, motels and camping. While relaxing tops the list of things to do in Paluma and the Northern Beaches, fishing, bird watching, walking trails and more all beckon from this tranquil part of the world. If waking to the soothing sounds of birdlife or the ocean sounds appealing, Paluma and the Northern Beaches are your ideal getaway. Camping, motels and hosted accommodation are all available.